You planned on having a mellow Halloween this year. You had every intention of lounging in sweatpants, munching on popcorn, and streaming scary movies on Netflix, reluctantly hitting pause to hand out candy to eager trick-or-treaters banging on your door. But then that nagging voice in your head got to you. You’re not sure, maybe it’s because Halloween falls on a Saturday this year, or perhaps it’s because the neighborhood kids are getting older and something’s suddenly telling you that you’re going to miss all this. Whatever it is, you’ve decided to plan the perfect party for Halloween this year. The only catch is, it’s nearly Halloween and all the local party stores ran out of the good decorations weeks ago. Let trick-or-treaters know what they’re getting themselves into right from the get-go. 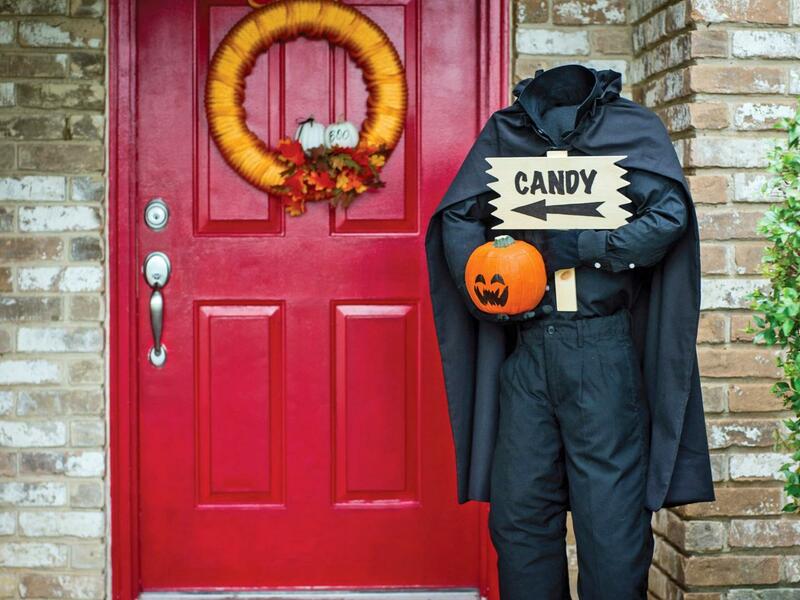 Create a headless horseman to stand on your porch and welcome visitors and party guests. Step 1: Tape the hanger to the top of the broom. It will be the horseman’s shoulders. Bend the hanger hook down to hide it. Tape the second hanger around the middle of the broom. This will be his waist. Step 2: Put the shirt and pants on, stuffing it with paper to make it look full. Step 3: Fill the gloves with shredded paper to look full and attach the gloves to the sleeves of the shirt with rubber bands or duct tape (don’t make the hands too heavy). Step 4: Tie the cape around the shoulders (cut the trash bag open to create a cape). Step 5: Put rocks in the boots to weigh them down. Then place the boots inside the pant legs. Step 6: Tape the pumpkin bucket to the horseman’s hands. Show your guests who’s the boss with the head of a witch displayed in your living room. No one gets out alive in your haunted mansion! Well, not until you’re ready to call it a night and tell everyone to go home, you’ll see ‘em next year. Step 1: Set the pumpkin on its side (the stem of the pumpkin will be the witch’s nose). Step 2: Draw eyes and a frown on the pumpkin with the sharpie marker. Step 3: Mix ketchup, cocoa powder, and syrup in a blender to make fake blood. Step 4: Smear the fake blood all over the pumpkin (your witch), especially dripping from her mouth. Step 5: Tape the witches hat on top of her head (the tape should not be visible). Step 6: Stab a large kitchen knife in the side of her head (where her ear would be). Check out the video on how to create a witches head on ParentsMagazine. Your guests will have nowhere to hide in your haunted mansion. Not after you hang DIY ghosts throughout your house, that is. Step 1: Fold the sheet in half. Step 2: Fill the top of the sheet with paper (this will be the ghost’s head). Step 3: Use the tape to create the ghost’s neck (two layers of tape should suffice). The sheet beneath the tape should dangle freely, so don’t make the head too large. Step 4: Use the sharpie marker to draw eyes on the ghost. Step 5: Again, mix ketchup, cocoa powder, and syrup in a blender to make fake blood then smear the blood all over the ghost. Visible bloody fingerprints and handprints would work great. Step 6: Shred the bottom of the sheet with scissors (optional). Step 7: Tie the fishing wire around the ghost’s neck and attach to the ceiling. Make as many ghosts as possible and hang them from the ceiling all throughout your house (don’t forget the bathroom). Ghostly! What’s Halloween without spider webs? Your guests will expect this Halloween staple. Don’t let them down. Besides, this one’s the easiest DIY trick of them all. Take that dusty cotton ball bag out from your bathroom cupboard. It might take you a minute or two to remember exactly what cupboard they’re in. Once you find them, take one cotton ball at a time and transform it into a spider web. To do this, gently spread the cotton ball apart. Stretch it as far as it will go without breaking. Make as many as you can and spread them throughout the house. Put them on the backs of chairs, on closet door handles, and on table legs. Don’t forget to place them on the table of hors-d’oeuvres. Eerie! Also, check out these awesome videos for some extra Halloween DIY Decoration ideas here and here! 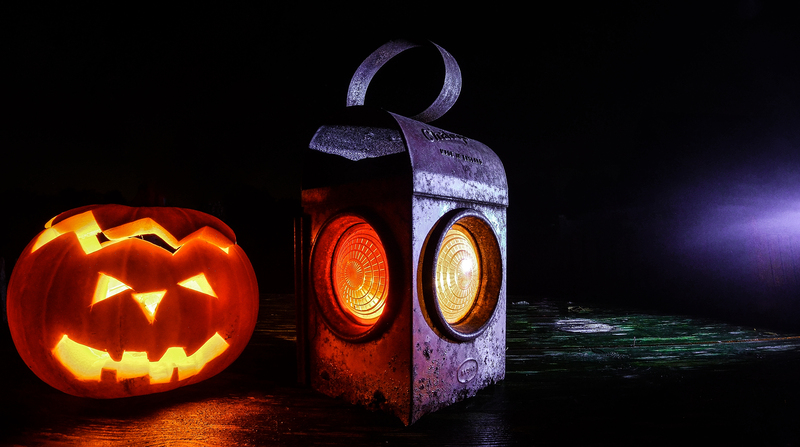 The Haunted House DIY Pinterest board is another great place to find last-minute projects. Once the party’s over, your decorations are taken down, and you’ve enjoyed your second cup of coffee, you might notice what a terrifying mess your party guests made. Not to worry! Contact us and we’ll refer you to the perfect housekeeper to clean your home. Give My Cleaning Lady at call at (909) 829-5882 or email us info@mycleaninglady.com today!